Getting ready for the upcoming new year, Starbucks releases a new trio of Black and White Mocha beverages for a short time through the first week of January 2018. Each of the drinks comes topped with whipped cream and a stripe of "sparkly" chocolate "sequins" meant to resemble a black tie. - Black and White Mocha - Espresso, mocha sauce, white chocolate mocha sauce, and steamed milk. - Black and White Cocoa - Mocha sauce, white chocolate mocha sauce, and steamed milk (i.e. the Black and White Mocha minus the coffee). 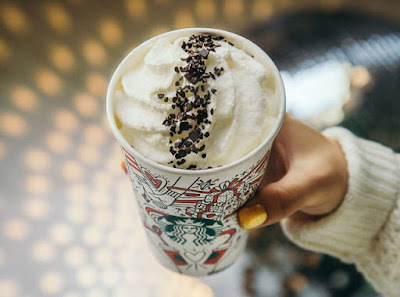 - Black and White Frappuccino - Mocha sauce, white chocolate mocha sauce, Frappuccino Roast coffee, and milk blended with ice (you can also get it without the coffee as a Black and White Creme Frappuccino). All three drinks can be found at participating Starbucks locations in the US and Canada through the first week of January 2018, while supplies last. While most Starbucks literature regarding the new drinks tout "dark mocha sauce," the ingredients listed on the Starbucks website reveal that it's the same as their regular mocha sauce. Last year, the chain offered a similar line of Tuxedo Mocha beverages.